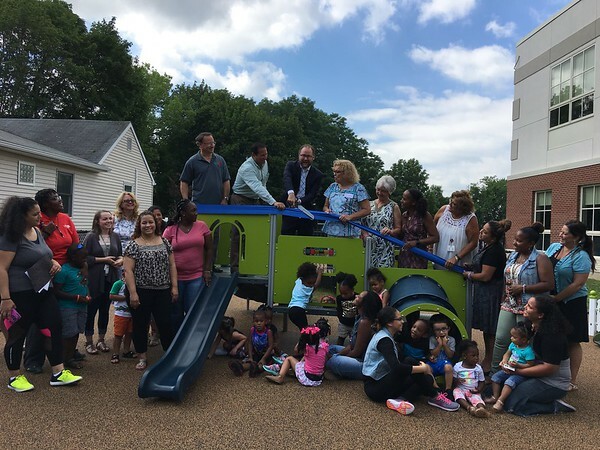 NEW BRITAIN -Toddlers and preschoolers who go to the Human Resources Agency of New Britain have a new playground. The playground was paid for with funding by the state Department of Education Office of Early Childhood. The HRA received $95,000 to build the multi-purpose playground in 2015, and Friday’s ribbon cutting marked the completion of the project. “This facility has undergone many changes in the past 10 years, and one of the final things we needed to add was a state-of-the-art playground for the toddlers, which was long needed,” said HRA Executive Director Rocco Tricarico. David Wilkinson, commissioner of the state’s Office of Early Childhood, said the state was proud to help. “This is a national example of what we can build and what we can be doing for our future and our children,” Wilkinson said. Posted in New Britain Herald, General News, New Britain on Friday, 21 July 2017 21:51. Updated: Friday, 21 July 2017 21:53.